It’s easy to find romance in New Orleans. The jazz sets the tone…mellifluous and ever present. Toast your honey with one of the city’s famous or not-so-famous cocktails. Then dig into bowls of sensuous cuisine like shrimp n’ grits or crawfish etouffe. The music is the muse of New Orleans, begging couples to swing onto the dance floor or snuggle up in a nightclub booth for a kiss. Even the architecture is romantic, with flower vines winding around rusting wrought iron balconies, somehow more beautiful for the wear. The people of New Orleans are friendly, almost suspiciously so. After a few days, couples find they are friendlier, too. It’s not hard to find romance in the Big Easy. Let me make it even easier for you with these 10 ways to find romance in New Orleans. 1. Listen to live jazz together. 2. Get into the spirit of New Orleans cocktail culture. 3. Find romance in New Orleans on the Mississippi River. 4. 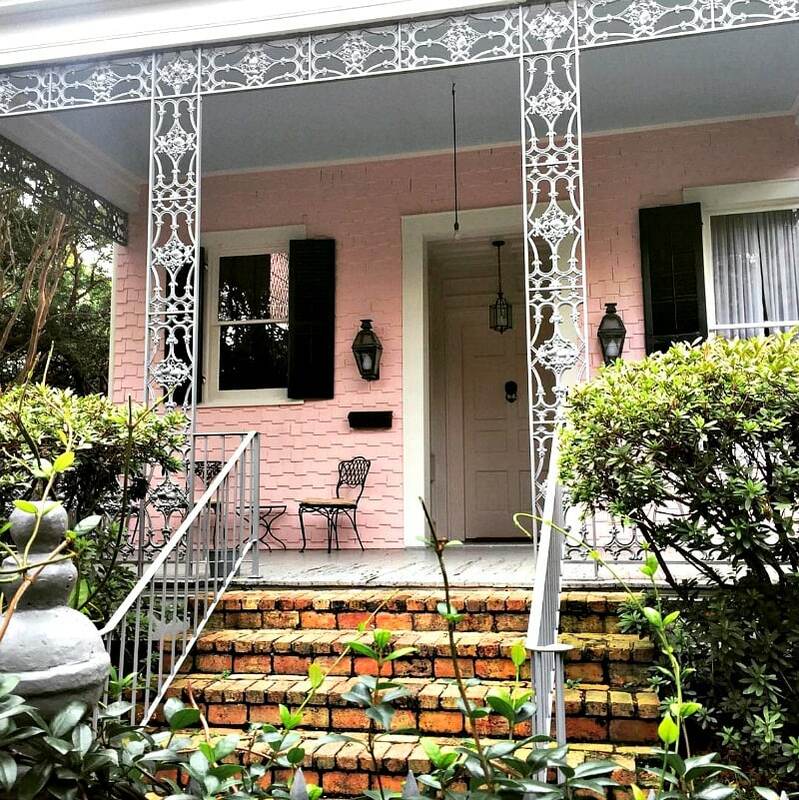 Tour the romantic architecture of the Garden District. 5. Walk hand-in-hand at New Orleans City Park. 6. Get a couple’s fortune reading. 7. Get passionate about Creole cuisine. 8. Indulge in something sweet with your honey. 9. Snuggle up in a romantic hotel. 10. Bring home the flavor and romance of New Orleans. It would be a sin to visit New Orleans and not listen to live jazz. It might be impossible to do, actually, with all of the musicians playing on street corners, in restaurants, and in nearly every bar. Even if you think you don’t like jazz, you may find your toes tapping to this town’s sweet tunes. Most jazz clubs in New Orleans can be found on Frenchman Street, about a 10-minute Uber ride from the French Quarter. For the most authentic jazz experience near Bourbon Street, buy tickets for Preservation Hall. You can’t buy drinks here, but you can bring in libations from nearby watering holes. Prepare to stand unless you line up very early for one of the shows (8, 9 and 10 pm nightly). All ages are welcomed here. My husband and I fell in love with the local jazz band, the Ibervillianaires. My favorite memory from our New Orleans romantic getaway is half-dancing in my barstool at the 21st Amendment Bar in the French Quarter while watching these incredible musicians jam out. The lead singer, Chance Bushman, gets the audience clapping, laughing, dancing, and whooping—especially when he jumps out of his chair to scratch a tune or two with his tap shoes on a washboard. New Orleans is a cocktail town. Know for its original boozy concoctions like the Sazerac (rye whisky, sugar, bitters) and the Hurricane (rum, passion fruit juice, orange juice, lime juice, simple syrup, orange wedge and cherry), even dedicated wine drinkers like me succumb to the lure of mixed drinks. 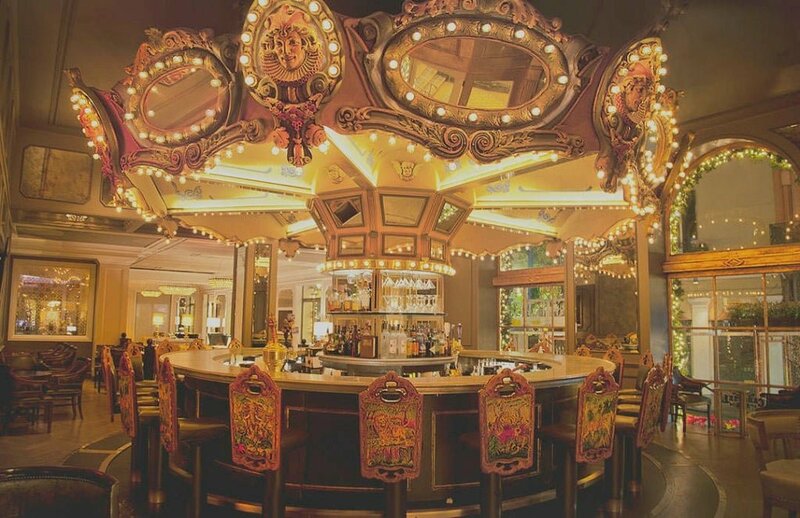 Be sure to take a spin on a barstool at the Carousel Bar at Hotel Monteleone, which slowly spins around its mixologists. Or, grab a Bubbly Vive at the swanky lobby bar at Hotel le Marais, a purple delight made from sparkling wine, Chambord and Creme de Violette. 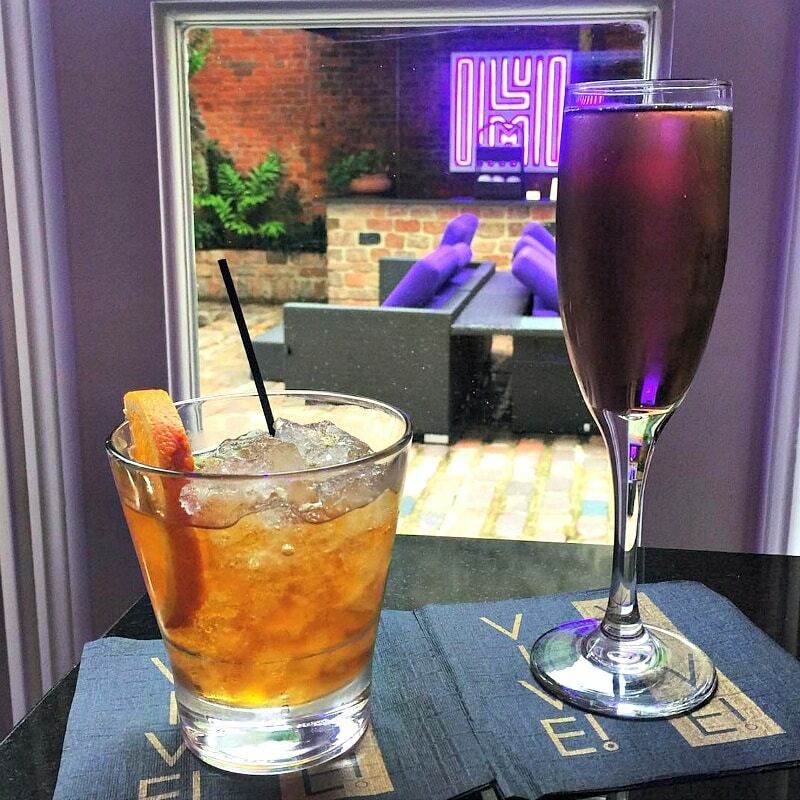 Even if you don’t drink alcohol, you’ll learn a lot on the New Orleans Original Cocktail Walking Tour with Grayline. Book your cocktail tour now. There’s something romantic about seeing a city skyline from the water. Set sail on the Mississippi River aboard the Steamboat Natchez during your romantic getaway. You can book a lunch or dinner sailing, but this cruise is about the views, not the food. Book your cruise now. Couples will enjoy a Garden District/Lafayette Cemetery Tour with Historic New Orleans Tours. Your knowledgeable guide will lead you past dreamy homes full of New Orleans charm, including the former home of Interview with the Vampire author Ann Rice and the vacation home of actress Sandra Bullock. Even the cemeteries in New Orleans are romantic with their beautiful above ground, often ornate graves. 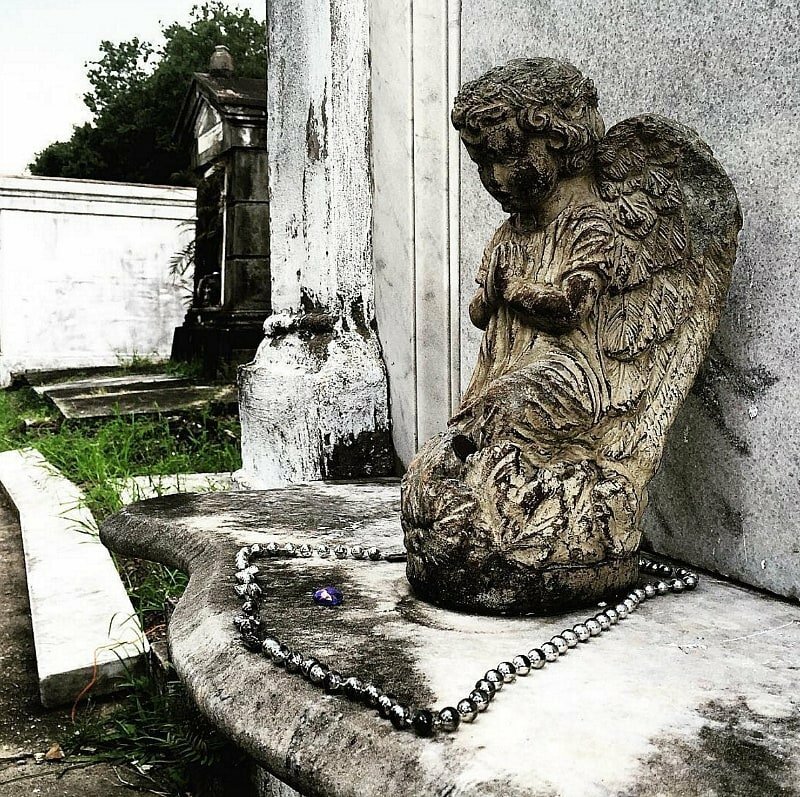 During your tour of Lafayette Cemetery #1, you’ll gain an interesting perspective into the lives and deaths of the people of New Orleans. The tombs of Rice’s Mayfair Witches and Lestat the vampire were based on this cemetery. Book your historic New Orleans tour now. 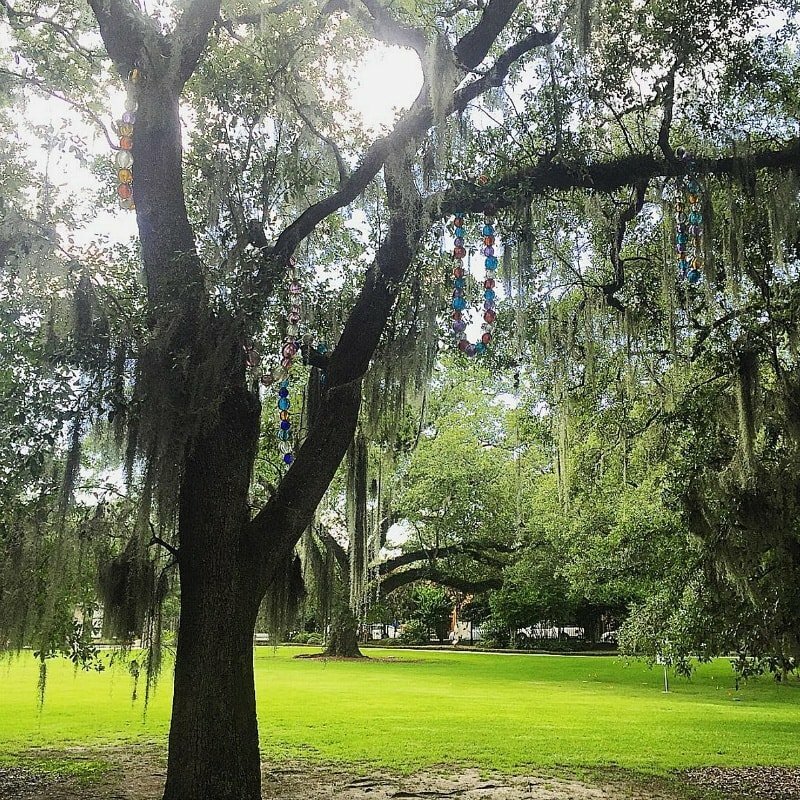 After a few days exploring the city, get your nature fix at New Orleans City Park. There’s plenty to explore at this 1,300-acre green space. Stop to smell the flowers at the New Orleans Botanic Garden, admire the artwork at the New Orleans Museum of Art and Sculpture Garden, play a round of mini golf at City Putt, and much more. To reach this sprawling park in Mid-City, take the red Canal Streetcar. Bonus: they’re air conditioned! Voodoo is a big part of New Orleans’ culture. You don’t need to be a believer to have a little fun with Voodoo during your stay. Everything’s better together, so make a reservation for a couple’s reading to learn your fortunes at Voodoo Authentica in the French Quarter. While there, pick up a Love & Passion Voodoo Doll to spice up your love life. Hey…couldn’t hurt! If celebrating an anniversary or other big event, you must make reservations at Commander’s Palace in the Garden District. My husband and I splurged on dinner at this renowned restaurant in the Garden District on the night of our 15th wedding anniversary. This is old school New Orleans at its finest. Be sure to to order their famous table-side bananas foster for a sultry, caramelized top to your evening. My husband and I spared little expense when dining in New Orleans, and we both came home with a little extra love in our love handles because of it. The best restaurant by far was Arnaud’s Restaurant. It was so good, in fact, that we went back for a second meal during our romantic getaway. Order their unforgettable Crawfish O’Connor, the restaurant’s brandy-infused version of crawfish etoufee. This is a dish that will forever live in your mouth’s fairytales. Known as an aphrodisiac, oysters are a specialty in New Orleans. Michael Jackson has been shucking oysters and making friends with diners at Felix’s Restaurant and Oyster Bar since 1999. (Yes, that’s his real name.) He’s who you picture when you think of a N’awlin’s oyster shucker, with a gravely voice like Louis Armstrong and an easy laugh. Across the street is the more famous Acme Oyster House, where the line out front is longer but both restaurants earned four stars on Yelp. For crazy delicious late night eats, pull up a bar stool at 13 Monaghan for some Srirachos on Frenchmen Street. These crispy tater tots come topped with chicken, cheddar cheese, jalapeños, cilantro, and a Sriracha ranch dressing. 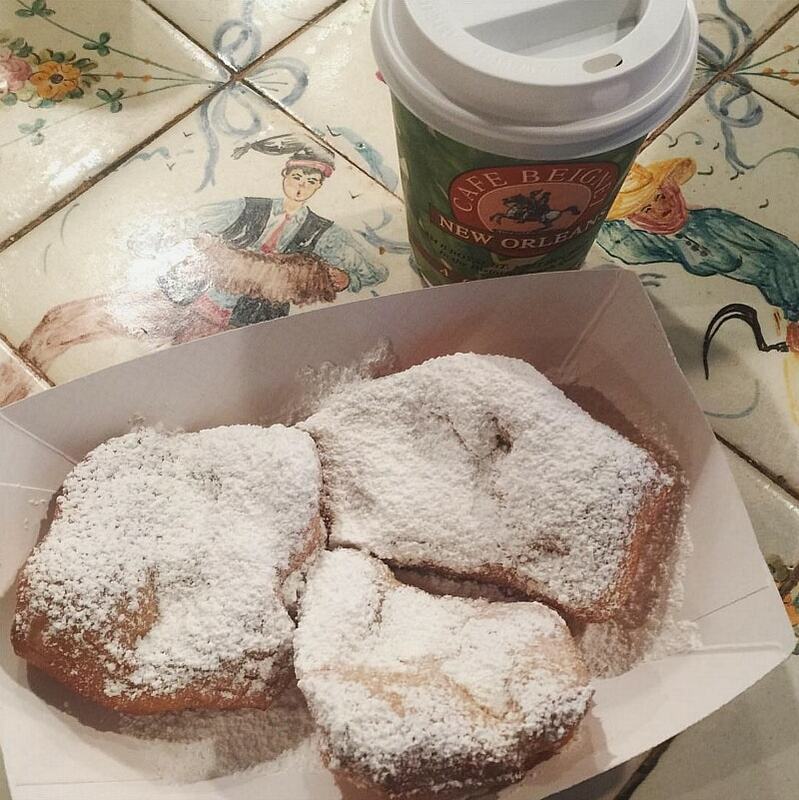 You’ve heard of Cafe du Monde, of course. But a local advised us to skip their long lines and pre-made beignets in favor of the made-to-order delights at Cafe Beignet. Although I’m gluten-sensitive, I indulged in one of their freshly fried square doughnuts topped with powdered sugar. They’re delectably sweet, chewy and soft with just a slight crunch. Pralines are all the rage in New Orleans. These confections are made from pecans, sugar, butter and cream. A bit too sweet for my palate, I prefer the Louisiana Turtles (pecans draped in caramel and dark or milk chocolate) at Laura’s Candies. The oldest candy shop in New Orleans offers all sorts of pralines, as well as truffles, chocolate-covered Oreos, and other candies. 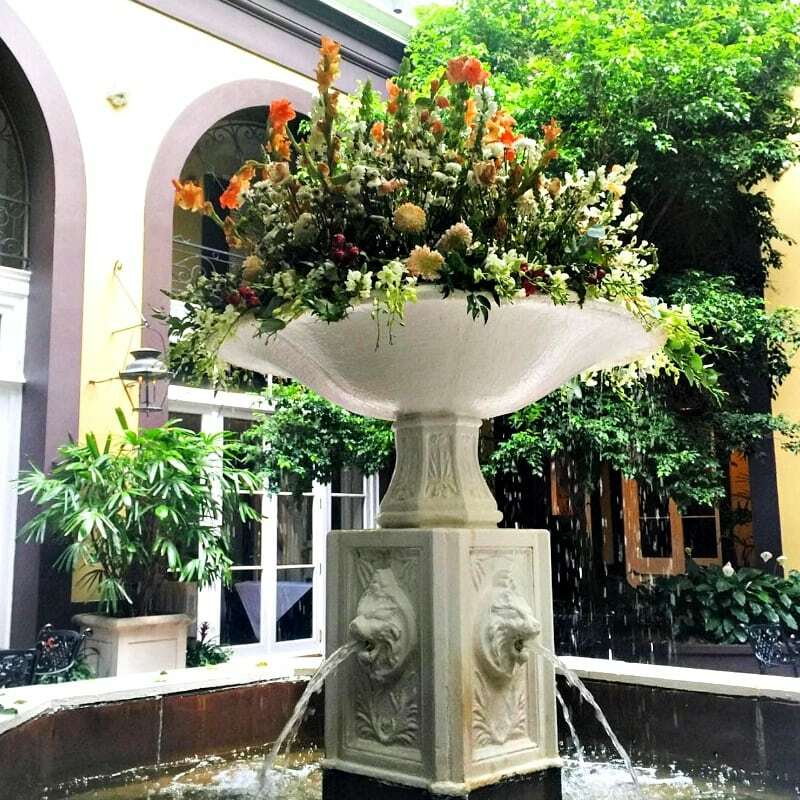 Booking the right hotel is imperative when seeking romance in New Orleans. For me, nowhere but the famous French Quarter would do. I wanted to stay somewhere intimate, with that romantic New Orleans curly cued architecture and French accents. That’s exactly what I found at Hotel Mazarin. This friendly luxury boutique hotel serves a complimentary hot breakfast to guests in a pretty courtyard each morning. Read more about this hotel on TripAdvisor. For a more modern vibe, choose sister property Hotel Le Marais. Purple is the signature color at this chic hotel. Located just a block from Bourbon Street, you’ll be close to the action but far enough away that you can sleep peacefully. My favorite part during our romantic getaway? 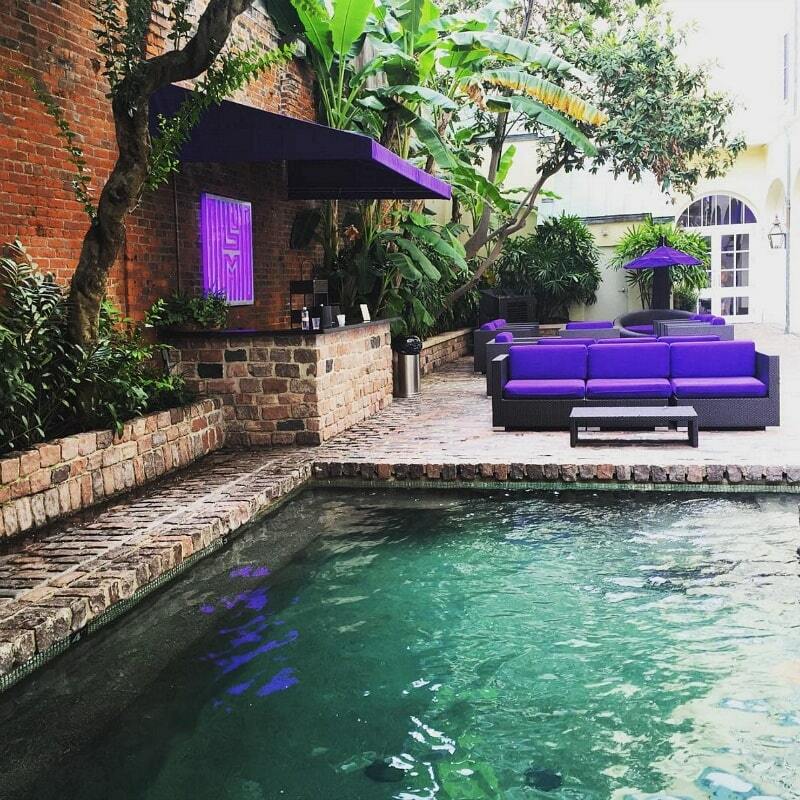 The swanky courtyard pool that provides a refreshing way to cool off after a hot day exploring New Orleans. Breakfast is also included here. Read reviews of Hotel Le Marais on TripAdvisor. Hotel Mazarin and Hotel Le Marais are both part of the New Orleans Hotel Collection. All seven of their hotels boast glowing reviews and would surely make a lovely way to find romance in New Orleans. 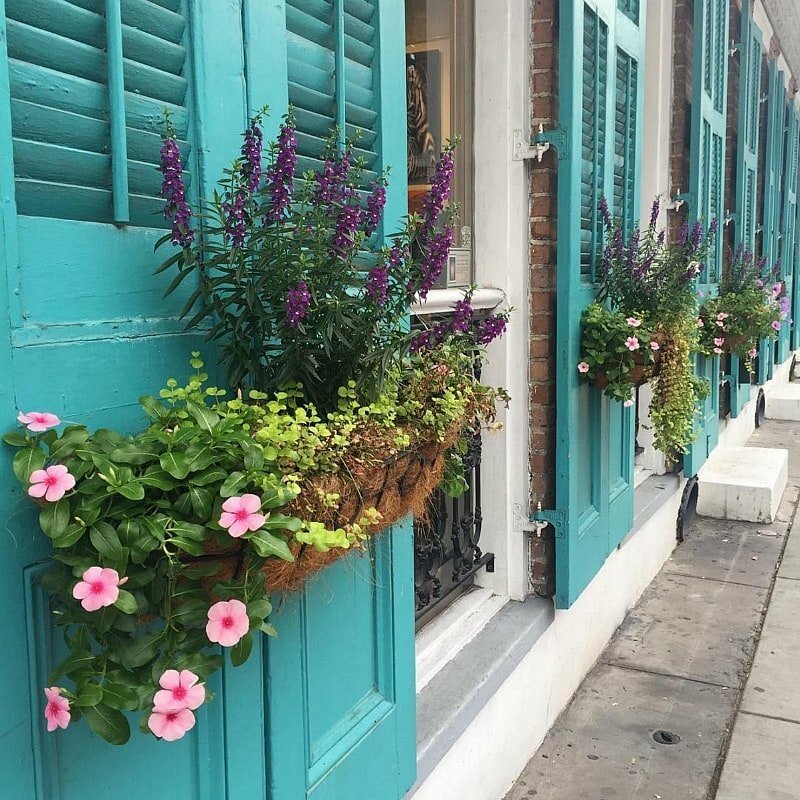 Part of the pleasure of any trip to New Orleans is wandering through the French Quarter and popping in to the many cute boutiques and souvenir shops. 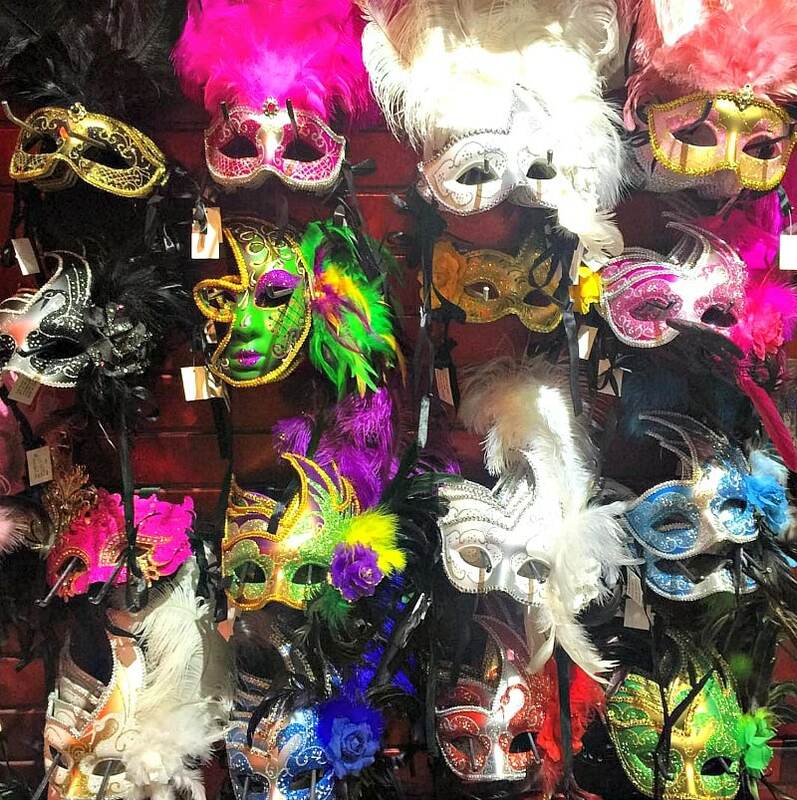 Of course, you’ll want to buy some Mardi Gras beads and maybe a Carnival mask or two. Forever New Orleans offers upscale souvenirs celebrating all things Crescent City. Stop at Santa’s Quarters to add a little jazz to your Christmas ornament collection. Art Galleries abound in the French Quarter, which are fun to peruse even if you don’t make a purchase. You’ll feel a little less guilty about leaving the kiddies at home when you pick up a couple of gifts from the Little Toy Shop. At the Pepper Palace, you can sample dozens of hot sauces before selecting your favorite to bring a little Louisiana spice home with you. Bringing the kids along? Read our tips for visiting New Orleans with kids. To learn about “the other side” of Louisiana, check out this story about Shreveport-Bossier. I found Frommer’s New Orleans Day by Day to be a very helpful resource in planning our trip. It’s a pocket-sized guide book with 22 smart ways to explore the city and includes a handy foldout map. Get your guide now! Would you like to visit New Orleans with your sweetheart? Do you have any additional tips for finding romance in New Orleans? Let us know in the comments below! 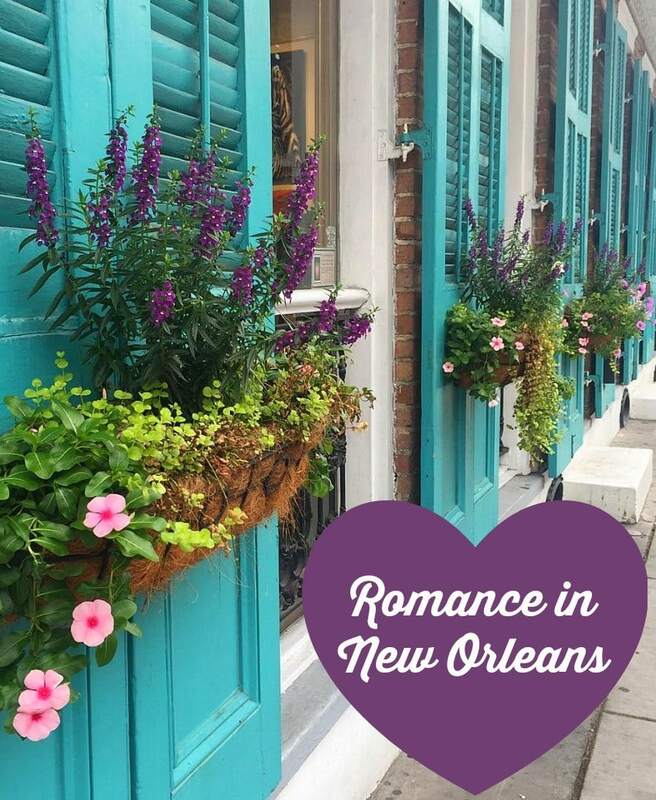 A Note from The Travel Mama: I received some media discounts and comps from the New Orleans Hotel Collection and the New Orleans Convention & Visitors Bureau related to this story about romance in New Orleans. As always, my opinions are my own. This post includes affiliate links. This story originally posted in September 2016 and was updated in July 2017. The cocktail walking tour was really informative and fun! Thanks for your comment, Anuradha. I’m so glad you mentioned live jazz. Definitely one of my favorite experiences in that area! Of course! A visit to New Orleans wouldn’t be complete without listening to live jazz! This looks like a great place to visit with your loved one. I would love to go and get a made-to-order beignet. My husband waited in the loooong line at Cafe du Monde to taste a beignet for comparison. He said it was dry and unappetizing so he only had one bite and threw the rest away. You really must go to Cafe Beignet for the best beignet in New Orleans! These are all great ways to find some romance in New Orleans. I actually stopped in New Orleans with my husband while on our honeymoon. What a fun place to honeymoon! Yes we’d love to visit, I think we’d have a wonderful time. I love all of these ideas especially staying at a romantic hotel and walking hand in hand through the city park and enjoying the cuisine. I hope you get to visit New Orleans someday very soon! New Orleans looks so beautiful! This is definitely somewhere my husband and I would have a ton of fun visiting! I’ll be you and your husband love New Orleans, Brandy! The south is romantic itself, isn’t it? The weeping willows, the architecture, swoon. I think I’m overdue on a visit, love New Orleans! I think you’re overdue, too! Hope you can visit the Big Easy again soon! I have always wanted to go to New Orleans. Going there with the hubby will be great and we will take advantage of all of these ideas. Enjoy New Orleans with your hubby, Kelly! When I lived in Oklahoma it seems like all of my friends were constantly road-tripping to Nawlins’ for this or that and I never got a chance to go. I lived in OK for most of my life and now that I live in MI I sure wish I would have gone on one of those road trips. It’s not too late, Chrystal! Sign up for a fare alert with a website like Kayak or FareAlert.com and pounce on a flight to New Orleans as soon as the price dips! NOLA is definitely on my travel bucket list to head to when the kids move out. It does seem like a city rich in history and romance. I can’t wait to tour it myself someday! New Orleans is extremely high on my US travel bucket list and there is no one I would rather have accompany me than my husband. It is nice to know that there is room for romance along with all of the culture and history. The Big Easy really is such a romantic city. I hope you and your husband get a chance to visit! This is such a great place during your honeymoon or anniversary! Love is in the air! I love the romantic ambiance! Sooooo romantic! Thank you for your comment, Toni. Oh, such a romantic getaway! I am sure my husband would love to walk hand in hand in New Orleans City Park! I did not know there were so many romantic spots in New Orleans. I hope we can celebrate our wedding anniversary here next year. You’ll love it, Annemarie! I hope you and your husband can visit next year for your anniversary! My husband and I do live music. However, we’ve never gotten to see jazz performers before! On our to-do list for sure! The jazz in New Orleans is not to be missed, for sure! This place looks like the perfect getaway! I have not had the pleasure to go to New Orleans so this post has me wanting to go more and more. The images shared here are just breathtaking! Thanks for sharing! Thank you for your comment! I am glad you enjoyed the photos and hope you can visit New Orleans soon! I am not really looking for romance right now, but there’s no denying that New Orleans is such a lovely place! I think these are great ideas and it’s perfect for both old and new couples. I totally understand, Amanda. New Orleans has great things to do for romance, family vacations, girlfriend getaways and more! I have always wanted to go to New Orleans. It looks like it would be so much fun. It has a ton of fun activities to do. Ann – Yes, you certainly won’t be bored in New Orleans! I really recommend signing up for a tour or two while there to maximize your visit. I haven’t been inNew Orleans. Looks like a very romantic place, I will include this in my bucket list. 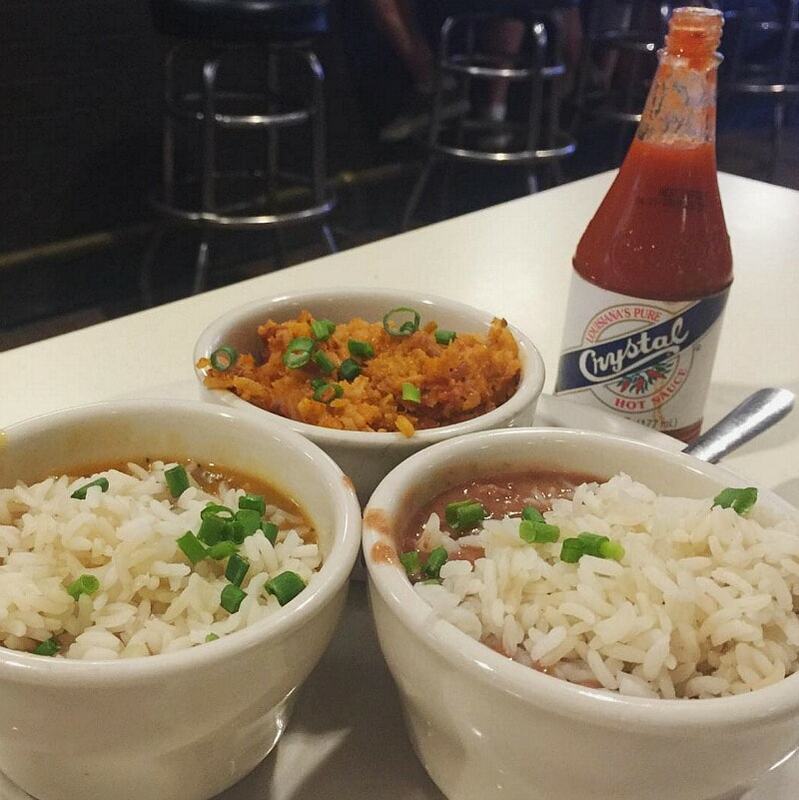 Gervin – New Orleans definitely deserves to be on any travel bucket list! Wow, I want to go to this place. Me and hubby will surely enjoy the romantic ambiance there. 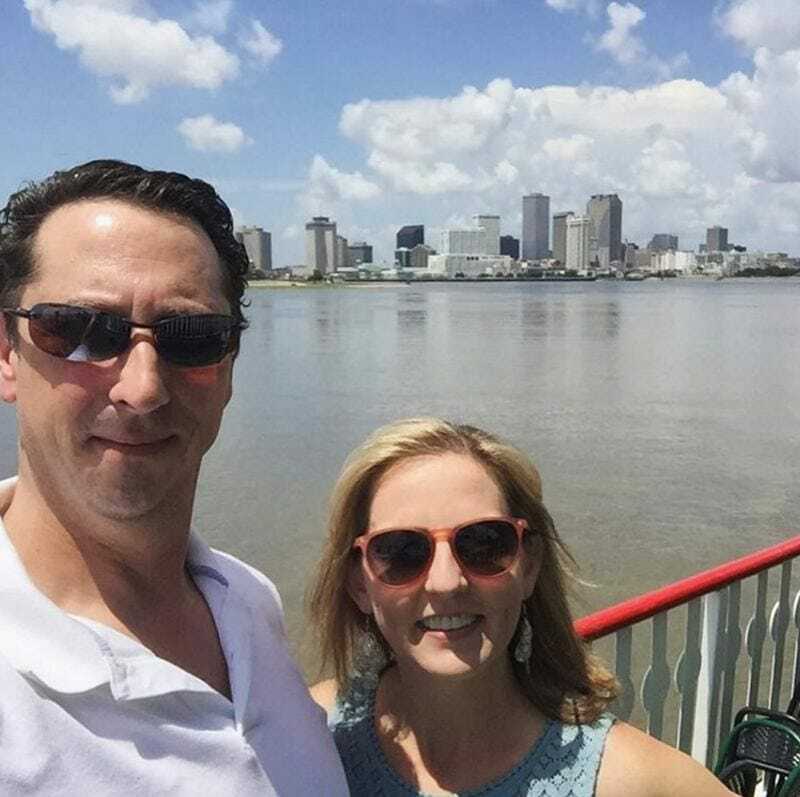 Nicole – I hope you and your husband love New Orleans as much as my husband and I did! I’ve never been to New Orleans and I am dying to get there. I love this post so much, I am going to show this to my husband and convince him that we need to go! Brianne – Oh wonderful! I hope you can convince him. I’m sure you two would have an incredible time in N’awlins! Oh nice! Looks like such a fun trip! Kristin – Indeed! It’d be hard NOT to have fun in New Orleans! New Orleans does have a unique flair contrary to other places. My friend once said, “you’ll find everything and all that jazz in this city”. Ah, what a great and beautiful city. I’ve never heard of a cocktail tour before, but I love it! Can’t wait to visit New Orleans myself. My younger sister is also a huge fan of Anne Rice’s books. A sisters trip to New Orleans would be so fun! Hope you get to visit the Big Easy sometime soon! Such a nice place for lovers. It seems extremely beautiful and romantic place. I was searching a place for my honeymoon and I found your blog and this article.Thanks for giving such wonderful romantic place advices.I would like to listen live jazz music and walk hand in hand in City Park. Coctail culture seems fantastic.Also Mississippi River would be nice. Congratulations on your upcoming wedding! 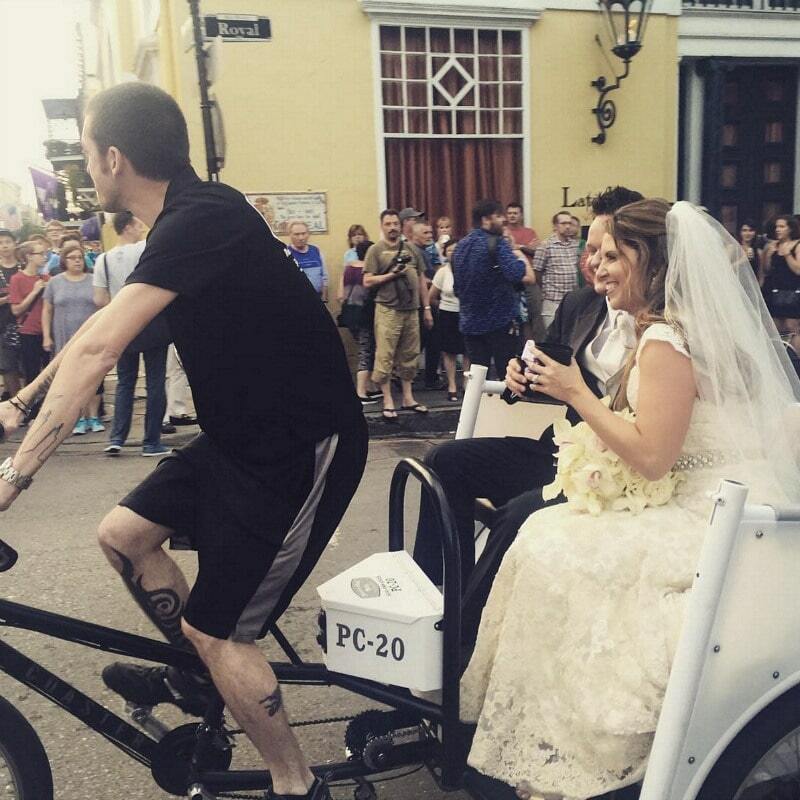 New Orleans would be a wonderful place to honeymoon. Enjoy! Cheers from the Unstoppable Family! Thank you for your comment, Rhonda. I found New Orleans to be incredibly romantic. So glad I was able to visit such a lovely and friendly city with my husband. Great article – New Orleans looks an amazing melting pot of cultures – I was particularly intrigued by the love and passion voodoo doll – did it work?! Hi Linzi – We didn’t buy a passion voodoo doll but my husband did get his fortune read at Voodoo Authentica. It’s all in good fun!